Over 7 months ago, I encountered my first RWB in person. It was an experience like no other and I’ll never forget the tears of joy running down my face as Toshiya Ichiraku’s ‘Rough Rhythm’ stood before me at Tokyo Auto Salon. I remember feeling so overwhelmed when I then went to an RWB party in Roppongi later that night, which made me wonder when we would start to see these incredible works of art on the streets of Australia. Little did I know that months later I would be jumping on a plane and flying to another state to witness the first RWB being built in the Southern Hemisphere. 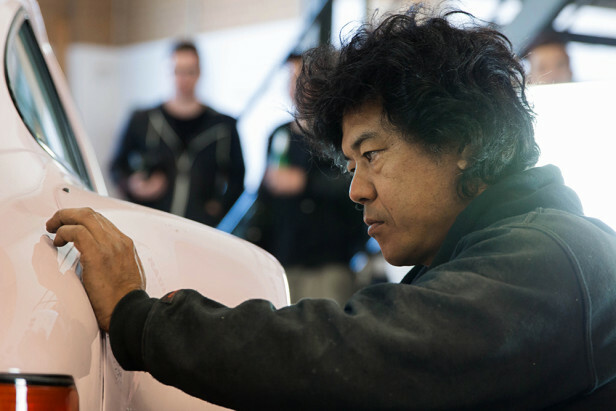 Just days after the 12hr Idlers endurance race in Motegi, Nakai-san headed off to the land down under to begin the build on a freshly painted pale pink 1986 Porsche 930 at ART – Auto Racing Technik, just 40 minutes north of Melbourne’s CBD. 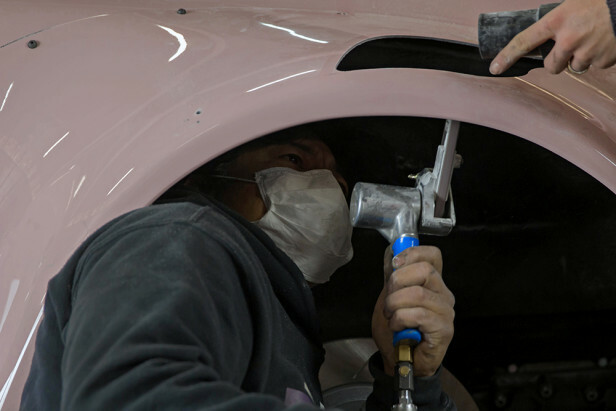 When I arrived at the workshop early Friday morning with a huge grin on my face, it was evident that Nakai had been busy the prior day as most of the body work was already complete. After a team breakfast, the man of few words got right back into the build as we all watched in awe. It was so incredible to view the build in person and I think the best thing about RWB is observing the bond between Nakai and each owner. 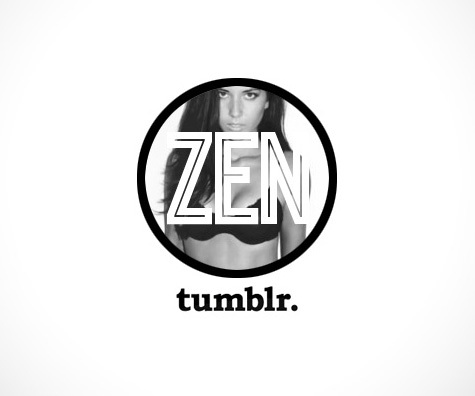 A connection I hope to one day experience for myself. You see the thing is, RWB isn’t just about cars, it’s about family and I feel so privileged to of met so many wonderful people whilst visiting Melbourne. 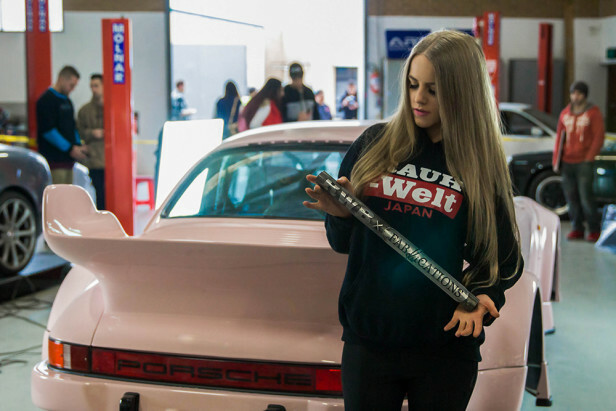 Chern from RWB Australia (also the owner of the Porsche) and the boys at ART were all so accommodating as they opened up the workshop to local car enthusiasts for the weekend. Watching the build in person makes you really start to appreciate Nakai’s endless passion for what he does. It’s astonishing how he manages to completely switch off the outside world, despite the large crowds and constant clicking as photographers captured each moment. 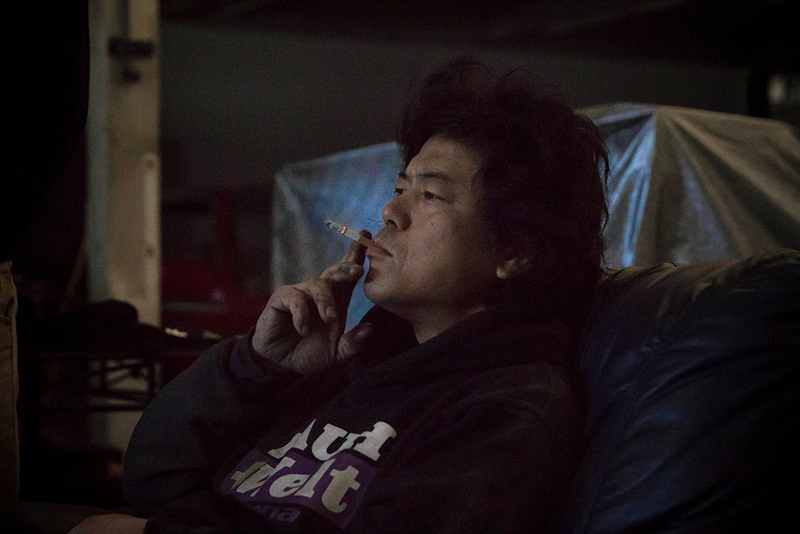 Nakai-san rarely stopped all weekend and when he did it was to sit back in his couch, light up a cigarette whilst accumulating what steps needed to be completed next on the car, and give a quick check of his old-school pink phone, which I later discovered he uses it to blog from – so cool! I couldn’t resist asking him to sign my Zen shirt which now hangs next to my computer. 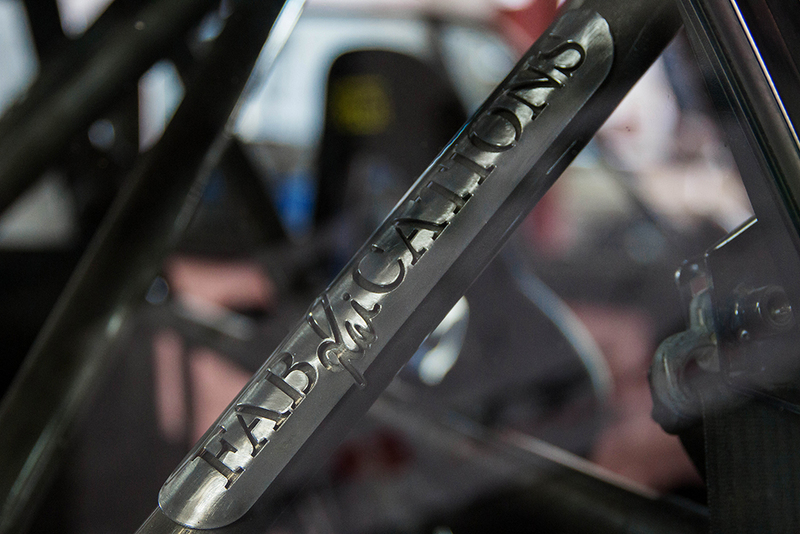 During the build I was drawn to the fine detail that has been put into the roll cage by the guys at Fabraications. These cars are not merely for show. Fitted with a VELO GPT-1 seat which was customised for a small frame driver and is FIA and ADR compliant, I’m sure Chern will be spending a considerable amount of time seated here. Plus future plans see this car hitting the track once all of the engine and tuning work with Auto Racing Technik is complete. A view I’d never get tired of. Seeing the cool cut out from the Rauh-Welt sticker whilst behind the wheel must feel amazing for anyone inside the car. The closest I’ll ever get to driving one is probably in the new Need For Speed game. 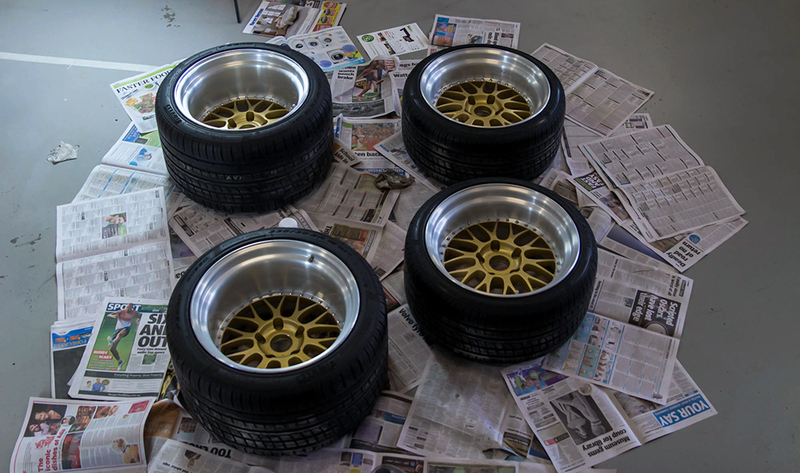 Something else I loved was the ‘RWB special’ Work Meister M1 3 piece wheels! I think the gold really complements the black, silver and pink scheme. Rear – 18″ x 13j, -61 offset, same tyres at 335/30/18. 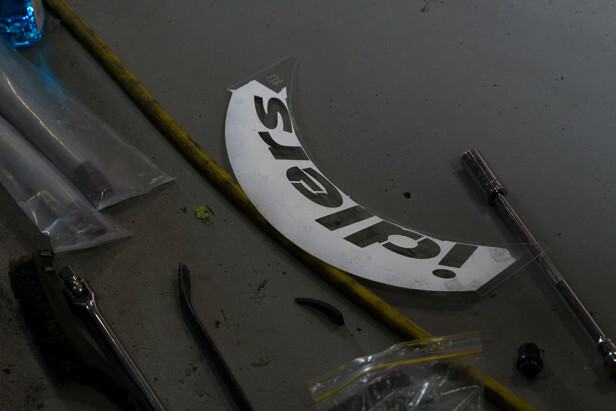 The famous ‘Idlers’ stencil which is used when spraying onto each tyres sidewall. 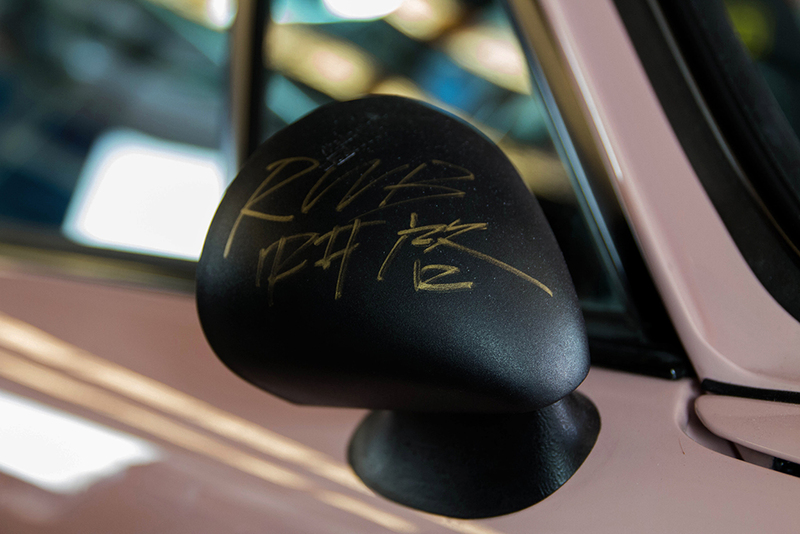 The vintage race inspired side mirrors, signed by Nakai also complement the new build nicely. 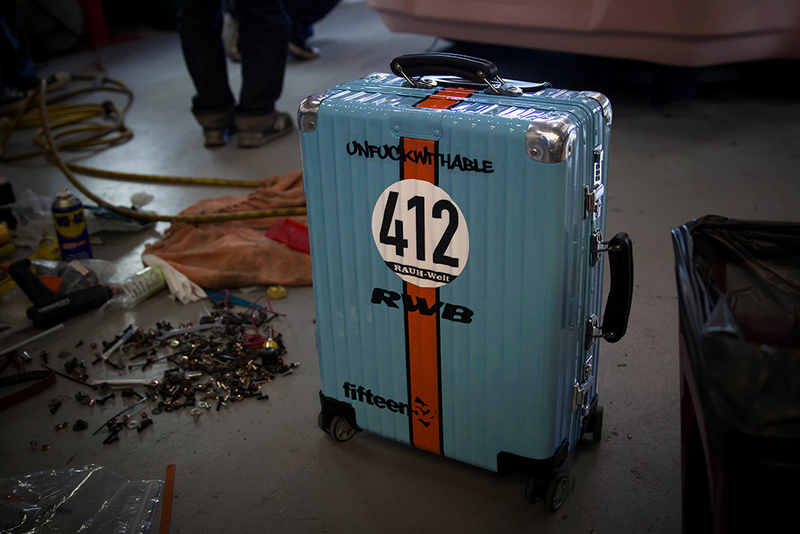 And how cool is this Gulf inspired suitcase owned by Christian from RWB Seattle and Malaysia. Christian was the one who initially informed me of the build over Instagram! It’s crazy how social media allows us to connect and then meet with people from all over the world. Chern’s favourite part of his new car is the fender wings that visually connects the side skirts, fenders and rear wing together. Every RWB is different upon close inspection and each fender cut out is unique, which I found was something quite compelling to watch. The incredibly huge wing attached to the rear of the car brings it all together and check out those wide curves in the photo below! After day 3 came to an end and the car was somewhat complete, we all listened as Chern gave a speech. We then headed out to a late dinner with the team where Nakai-san and Chern’s wife, Yori revealed the name of the first RWB in Australia. One of the many moments from the build that I’ll never forget! ‘Southern Cross’, or ‘Kreuz des Südens’ in German, was used by explorers in the past to circumnavigate the lower hemisphere. You can only experience the Southern Cross on this side of the world, and this is the first car in the Southern Hemisphere. Perfect name choice for the first build. The next day a small group of us headed back to the workshop so Nakai could add in the finishing touches. It was nice to watch Nakai without a huge crowd and I’m sure he was relieved to have some quiet one-on-one time with the car. Here he is going at the car without any templates! It was so surreal to watch him cut away at the fresh bumper as he tried to fit the exhaust. 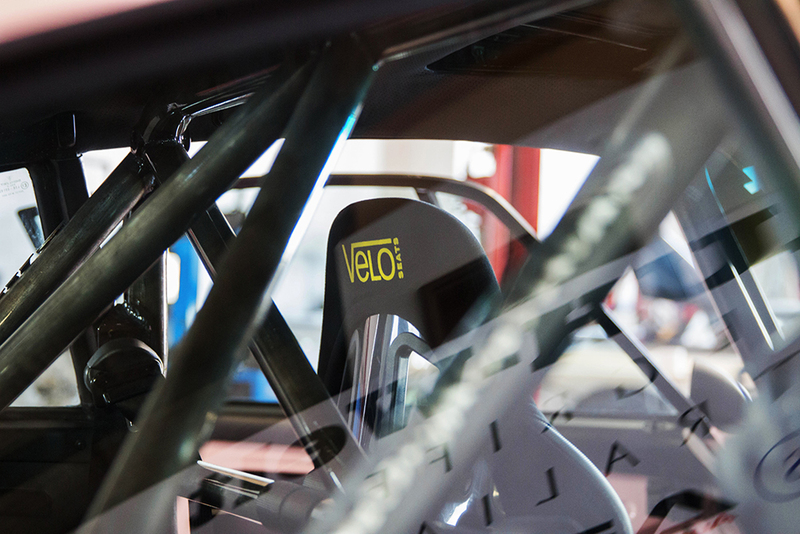 Once he was satisfied, the car was then pushed out to the workshop next door so an interview could take place. How nice does the car look outdoors!? Imagine being stuck behind this in traffic! 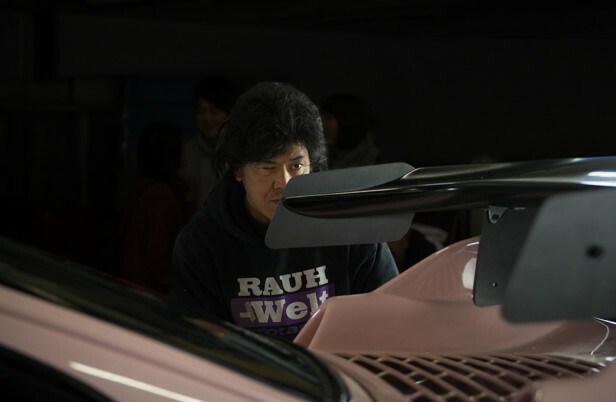 Although not many people were too keen on the chosen colour painted by Polo Body Works, I think it works and the cotton candy like pink chosen by Nakai was from Chern’s Japanese NJS track bike which he has had since 2009. He met Yori (his girlfriend, now wife) because of the bike so there’s a lot of history behind the colour. The workshop next door was filled with a handful of dream cars making a nice backdrop for the interview. Make sure you keep an eye out for the video by Xquisitefilms and for those in Melbourne be sure to check out the car at 100mm Australia in November. As the weekend came to a quick end, everyone went their separate ways and Nakai-san and Christian headed off to the Kuala Lumpur build. Now that I’m back in Sydney it’s safe to say that the RWB addiction has taken over and I’m having a serious FOMO from all the other builds that are coming up. I’d really love to see a Millennium Jade or Midnight Purple RWB next. What colour would you choose? Previous ArticleHeasman Steering - Is there anything these guys can't do? Next ArticlePainful Cars at SMASH!